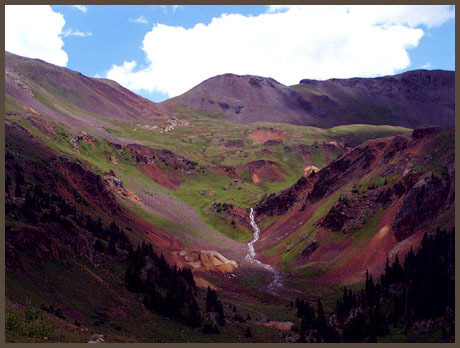 The flanks of Hurricane Peak proved to be irresistible to the miners of Silverton and Ouray. Consequently its slopes have been thoroughly sifted, and mining debris litters all sides. Another result of all this activity is that the peak is encircled by passes: California Pass, Hurricane Pass and Sunnyside Saddle. Of these three Sunnyside Saddle is the most obscure and therefor maybe the most unique for a mountain biker in the middle of the summer. The short portion over the saddle leaves behind the traffic jams of Texas jeep convoys, ATV blobs and exploding motor cycles. 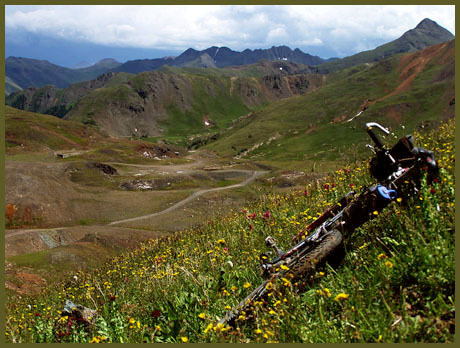 In order to do this one has to engage in a bike hike in the literal sense of the word. A short section on one side of the summit has only the very faintest of foot trails. 6. (9990ft,mile11) Eureka Gulch terminates in Animas Canyon. Profile continues to right, back to starting point. From South. The profile begins in Silverton and heads up Cement Creek. That part of the is described on the Hurricane Pass page. The turnoff to Sunnyside Saddle is not marked. But the first sight of the saddle is often mistaken for Hurricane Pass, which is out of sight on the left. The section between the turnoff and the saddle is really just a short traverse to the right. At the saddle the path continues steeply up Hurricane Peak, with no immediately apparent way down the other side into the Sunnyside Mining area with its drained Lake Emma. From North. (described downwards). Continuing up on foot a short distance above the saddle offers a better vantage point on the best way down. Continuing from the pass around the right side of the snowfield ( if it exists ) leads to an ever so faint path that leads down to the mining debris area in one single switchback. This section is not rideable. The continuation from Sunnyside ( that's the name of the mining debris ) down the dirt track into Eureka Gulch turns out to be a scenic highlight under the right light conditions. Emery Peak (13310 ft) forms an impressive triangle in the sky. Just before descending into lower Eureka Gulch a series of cascades and waterfalls on the opposite side of Animas Canyon dwarfs the altitude that the cyclist himself has been descending from the saddle, even though that seems like a very respectable altitude already. 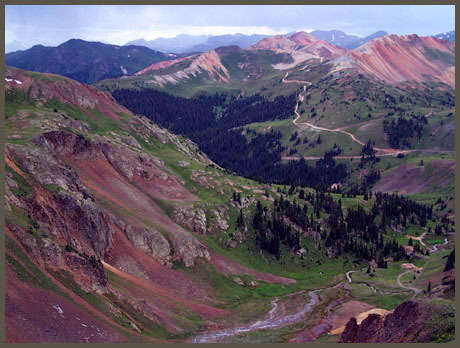 The profile returns to the starting point down Animas Valley to Silverton. Sunnyside Saddle: starting point near Silverton > up Cement Creek Rd > Sunnyside Saddle > down Eureka Gulch back to the starting point near Silverton: 21 miles in 3.3 hours ( no measured altitude gain due to altimeter malfunction ). Notes: The distance is a little shorter than shown on the profile, probably the loop did not go into Silverton. The 3.3 hours only account for the time the bike was moving. The actual trip with hike up towards Hurricane Peak took longer. (m3:06.07.24).